The president appoints all leaders to committees and members to standing, ad hoc, advisory, task force and other committees. County officials and staff wishing to serve on a Policy Steering Committee must apply through their state associations of counties. After receiving a recommendation from the state association, the NACo president confirms the appointment. Members of Standing Committees and Ad Hoc Committees are appointed by the NACo president. A Presidential Appointment Form is available on NACo's website here. Persons wishing to be considered for a leadership or committee appointment must complete the application and submit it by the posted deadline. Appointments are announced by the president during the Annual Business Meeting held during the Annual Conference. County officials and staff from NACo member counties with a population above 500,000 ay participate in the Large Urban County Caucus. What committee do you want to join? How do you become a member of a committee? Policy steering committee members are appointed by state associations and serve one-year terms. Members of all other committees are appointed by the NACo president and serve one-year terms. Policy steering committees annually review and make recommendations on federal policy issues and legislation. They start the policy development process leading to the development of the American County Platform, which guides the county government message presented to the Administration, Congress, U.S. Courts and the American public. Standing committees, such as the Membership Committee, Programs and Services Committee, Finance Committee and the Information Technology Committee, make recommendations on programs and projects for NACo to pursue that will help counties. There are 10 NACo policy steering committees that cover the full range of county policy issues. Fill out and submit a nomination form to serve on a NACo policy steering committee to your state association of counties. (www.naco.org/nomination). Mark on the nomination form your first and second choice for which policy steering committee you would like to serve. 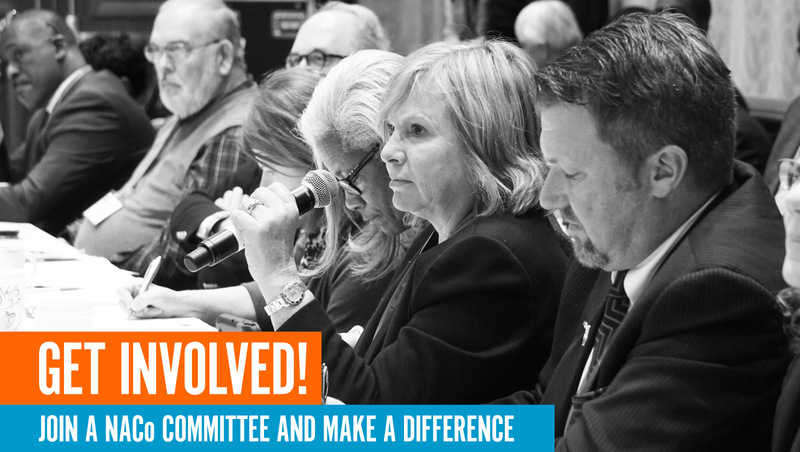 Members of NACo affiliate organizations who want to serve on policy steering committees should follow the same process. Submit the form to your state association one month before the NACo Annual Conference, which usually occurs in July. NACo works to accommodate a nominee’s first choice of policy steering committee assignments. Officials cannot transfer membership to another committee during their year of service, or serve on more than one policy steering committee during the year. Responsible for all matters pertaining to USDA agriculture, rural development programs, rural renewable energy development, research and extension, food safety, and conservation programs. Responsible for all matters pertaining to air, water, energy, and land use, including water resources/management, stormwater, pesticides, air quality standards, solid, hazardous, and nuclear waste handling, transport, and disposal, national energy policy, renewable/alternative energy, alternative fuel vehicles, energy facility siting, electricity utility restructuring, pipeline safety, oil spills, superfund/brownfields, eminent domain, land use, coastal management, oceans, parks and recreation. Responsible for all matters pertaining to the financial resources of counties, fiscal management, federal assistance, municipal borrowing, county revenues, pensions, the federal budget, federal tax reform, elections and Native American issues. Responsible for all matters pertaining to public health and healthy communities, including disease and injury prevention, health disparities reduction, health financing, health insurance, Medicaid, Medicare, long-term care, behavioral health services, substance abuse prevention and treatment. Responsible for all matters pertaining to children’s issues, foster care, public assistance and income support, services to senior citizens and individuals with disabilities, immigration policy, social services, and elementary, secondary and post-secondary education. Responsible for all matters pertaining to criminal justice and public safety systems, including law enforcement, courts, corrections, homeland security, community crime prevention, juvenile justice and delinquency prevention, emergency management, fire prevention and control, and civil disturbances. Responsible for all matters pertaining to telecommunications and technology policy, including the county role as a telecommunications regulator, service provider, and consumer. Responsible for all matters pertaining to federal transportation legislation, funding and regulation and its impacts on county government. This includes highway and bridge development, finance and safety, public transit development and finance, transportation planning, airport development and service, passenger and freight railroads, ports and waterways, freight movement, and research and development of new modes of transportation. LUCC is a bipartisan coalition of elected county executives and board members from counties with more than 500,000 population. LUCC members work together to identify urban challenges, provide input in developing pragmatic national solutions, and implement grassroots programs that improve their communities. RAC is the voice for America’s rural counties before Congress and the Administration. County elected officials from rural areas are dedicated to solving many critical issues impacting rural life and development, including infrastructure development, broadband deployment, development of new rural clinics and hospitals, road and bridge construction and maintenance, business development opportunities, and many more county responsibilities. WIR is affiliated with NACo and is dedicated to the promotion of Western interests within NACo. WIR Board members are nominated by their state association of counties from only Western states. The Arts and Culture Commission demonstrates how the arts can be used by county officials to promote economic development and provide solutions to many of the challenges that they face, through workshop sessions, field trips and special publications. The Resilient Counties initiative is governed by the Resilient Counties Advisory Board, which advises NACo on the development and implementation of the organization’s resiliency and sustainability programs. The Advisory Board is made up of leaders from both county government and private organizations, and provides input to ensure that NACo’s resiliency programming is timely, innovative and meets the greatest needs of the nation’s 3,069 counties. NACo’s Healthy Counties is guided by the Healthy Counties Advisory Board, which is comprised of county officials and staff who are health leaders at NACo and corporate partners. The public/private Healthy Counties Advisory Board assists NACo in identifying the priorities and activities of the Healthy Counties Initiative and provides input and expertise on program implementation. This task force facilitates the exchange of information, ideas and resources, and guides NACo programming, concerning county-level engagement in international economic development activities. This committee engages NACo and its members to develop and highlight county best practices and policies to promote innovative programs, services and benefits for our nation’s military, veterans and their families. NACo’s Immigration Reform Task Force provides a forum for county officials from across the nation to discuss immigration and its impact on local governments. Although the Task Force does not vote on, or set, policy, it advises NACo’s policy steering committees on immigration matters and engages on these matters with federal agencies and coalition partners.